Jilted by NBC, the police drama Southland will be walking a new beat on TNT. The drama-intense network officially announced the pickup Monday, with Southland scheduled to debut on Tuesday, Jan. 12th opposite The Jay Leno Show. TNT first will air the seven episodes shown last season on NBC before continuing with the six hours shot for the Peacock before it reneged on an announcement to stick Southland on Friday nights. No further commitment has been made at this point, with Southland's ratings determining its future. 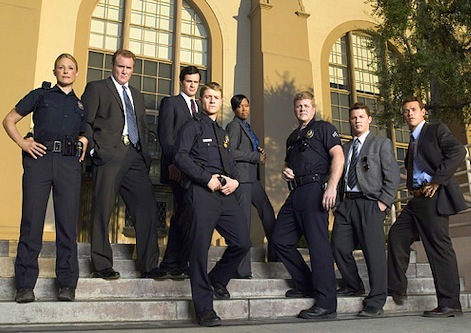 The series is centered on the relationship between a gruff veteran cop and his rookie partner, with Michael Cudlitz and Ben McKenzie of The O.C. starring. "This is a great win for fans of Southland and a perfect opportunity to introduce the series to new viewers," Turner Entertainment Networks president Steve Koonin said in a publicity release. "It's also another outstanding example of how TNT has established itself as the go-to place for the best dramas on television." Under its "We Know Drama" banner, TNT has introduced original series such as The Closer, Saving Grace, Raising the Bar, Leverage and HawthoRNe. It will add the new series Men of a Certain Age on Dec. 7th, with Ray Romano, Andre Braugher and Scott Bakula heading the cast. Southland is the second series in recent months to be canceled by NBC and revived by a rival network. CBS currently airs new episodes of Medium on Friday nights, following Ghost Whisperer. ***Stabbed by his crazed First Lady wife in Season 6, former president Charles Logan will return to Fox's 24 in Season 8. Emmy-nominated Gregory Itzin plays Logan, who's "reluctantly" summoned by President Allison Taylor (Emmy-winning Cherry Jones) to assist with "an escalating international diplomatic crisis." As previously posted, 24 returns on Jan. 17th with the usual two-hour season premiere. You can see the first official trailer here.